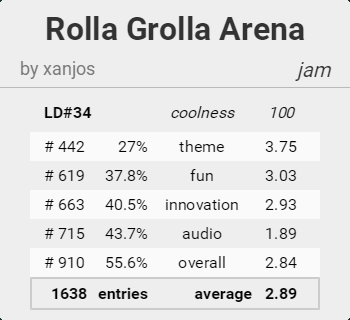 The results for Ludum Dare 34 were recently published this week and like before I’ll be doing a little analysis of how I did for my entry Rolla Grolla Arena, discussing where I did well and where I didn’t (Click here for the post-mortem). 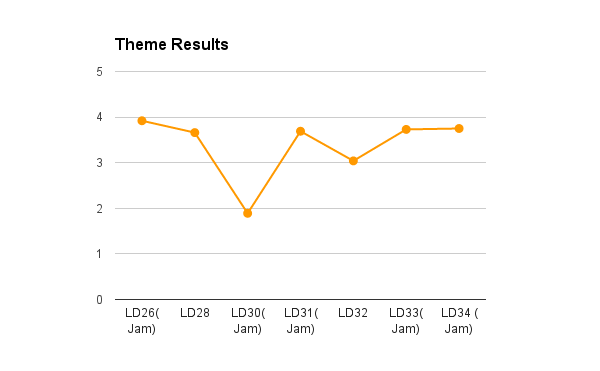 Whilst I’ve gone down in the standings compared to my last entry, in terms of score, I’ve actually done a bit better this time (although seeing as this Ludum Dare had two themes, it’s hard to tell which theme the ratings favoured more). A bit better than last time (in terms of both score and standings). I think I’ve managed to tie in the two button control scheme with the growing mechanic fairly well. As this was a local multiplayer entry, I expected that I would get a pretty good score in that category. In fact, this is now the highest I have ever scored for Fun. 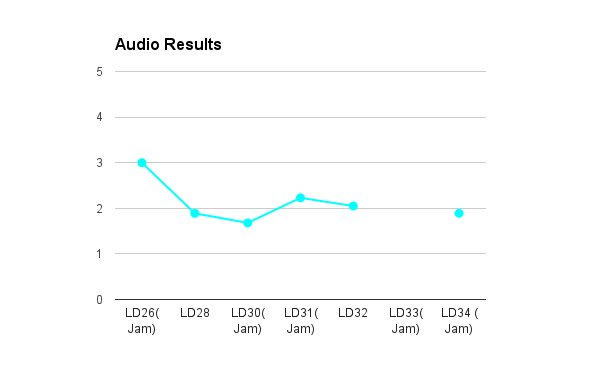 The low score for Audio was pretty much expected as the majority of complaints towards my entry were to do with the completely annoying background music loop I made (Unfortunately I didn’t have time during judging to make a mute option although it probably would be considered a post-jam addition). Strangely enough, although I’ve ended up with the same score as last time, this is actually the lowest I’ve ever placed in terms of standings (despite the fact that it’s in the same percentile as before) although to be fair, one possible reason for this could be the large number of entries compared to last time (Another reason could be the fact that not a lot people were able to play and rate the game due to it being local multiplayer only). Like before, I’ve chosen to opt out of the Graphics category although the reason why is slightly different as this time I reused the UI assets from my current project The Ball and the Ludum Dare rules request that you opt out of the Graphics and/or Audio categories if you used assets that you’ve previously created. In conclusion, despite not getting as much feedback as I’d hoped (since it was a local multiplayer game that required at least 2 players so not everyone was able to test it easily), I think I did pretty well in this jam although if I did certain things before submission like adding a mute button or get rid of the background loop completely, I probably would have gotten a better score (and maybe a top 100 placing). Making a local multiplayer entry was a bit of a risk (especially by myself) but it certainly made things a bit more interesting plus the fact that it gave me a new personal best for Fun makes me quite happy. In fact, I’m actually considering to continue work on this entry (once I’m finished with The Ball) and turn it into a fully fledged game for PC and consoles and possibly for the new Apple TV and certain Android based devices such as the Amazon Fire TV. As I have been taking part in Ludum Dare for a while now (with 7 games in total), it’s come to a point where I’m at my absolute limit with my skills and can’t seem to go any higher. 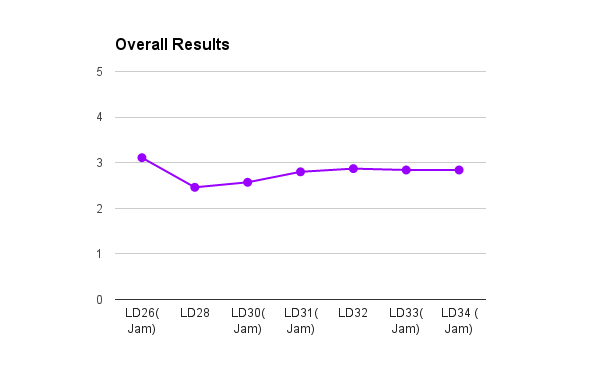 If you notice closely, most of my scores across each category seems to be more or less the same every time (For more details you can check my ldstats.info page). 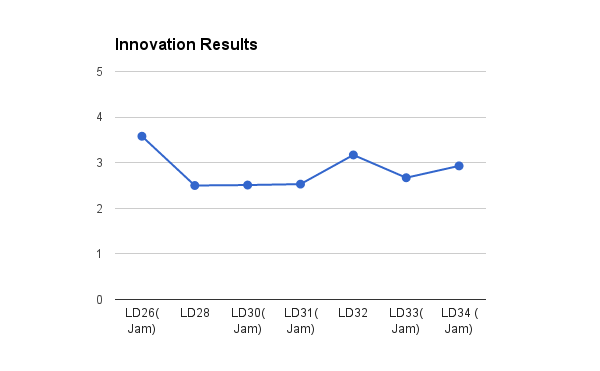 It could be all down to luck but one day I’d like to make a Ludum Dare entry that has a score of 4 and above in at least one category as well as a top 100 placing (the last time I actually broke in the top 100 was during Ludum Dare 26 - ironically the first time I ever took part - where I came 67th for Theme and 83rd for Innovation). The two categories that definitely need a lot of improvement are Graphics and Audio although (as I’m primarily a programmer) I don’t really consider myself to be a good artist and I’m obviously not a good musician either. 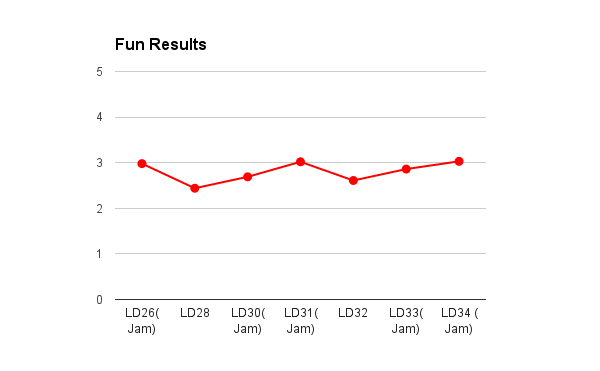 Chances are, if I make a game for the next Ludum Dare by myself again, I’ll probably end up with similar scores again although (I’ve probably stated this quite a few times already) I’d very much to take part in the jam with a friend who can do the art and sound whilst I can concentrate fully on the programming and design. That way, there’s a possibility my Graphics and Audio scores will go up.